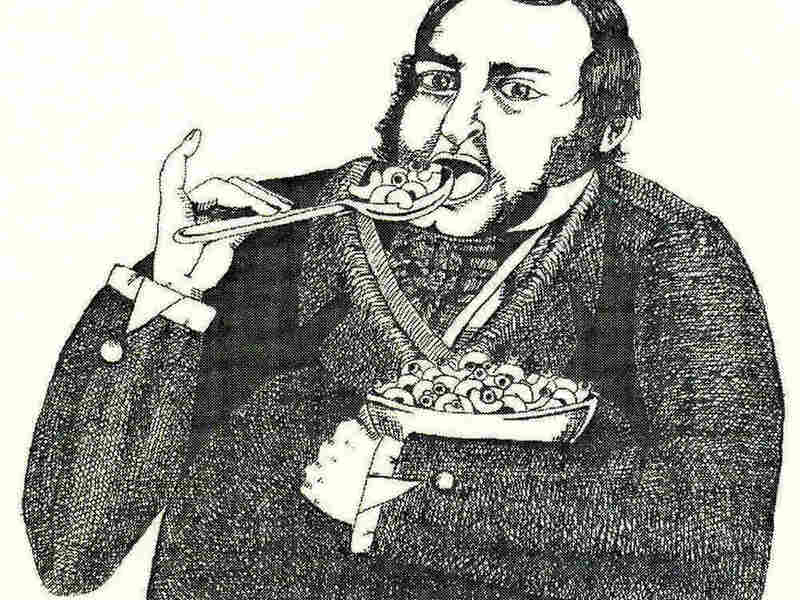 Composers In The Kitchen: Gioachino Rossini's Haute Cuisine : Deceptive Cadence Though Rossini mainly composed comic operas, he didn't fool around when it came to food. He considered eating one of life's most admirable occupations. 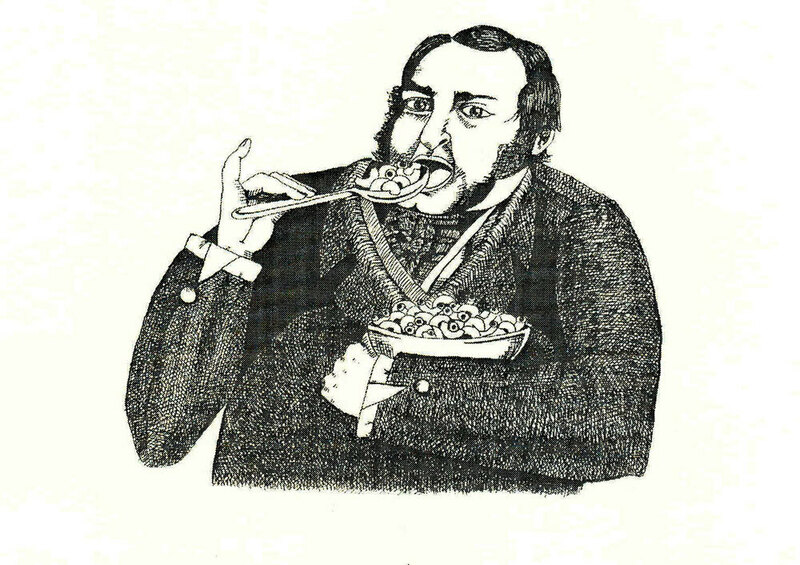 Rossini once said, "I know of no more admirable occupation than eating." Let's just leave it to the Grove Dictionary of Music and Musicians to characterize Gioachino Rossini's superstar status: "No composer in the first half of the 19th century enjoyed the measure of prestige, wealth, popular acclaim or artistic influence that belonged to Rossini. His contemporaries recognized him as the greatest Italian composer of his time." I know of no more admirable occupation than eating, that is really eating. Appetite is for the stomach what love is for the heart. The stomach is the conductor, who rules the grand orchestra of our passions, and rouses it to action. The bassoon or the piccolo, grumbling its discontent or shrilling its longing, personify the empty stomach for me. The stomach, replete, on the other hand, is the triangle of enjoyment or the kettledrum of joy. As for love, I regard her as the prima donna par excellence, the goddess who sings cavatinas to the brain, intoxicates the ear, and delights the heart. Eating, loving, singing and digesting are, in truth, the four acts of the comic opera known as life, and they pass like the bubbles of a bottle of champagne. Whoever lets them break without having enjoyed them is a complete fool. As for Rossini, the method of preparing filet of beef that bears his name, Tournedos Rossini, reminds us even today that he was a militant connoisseur. Though apparently a simple dish, Tournedos Rossini has the whole of grand cuisine behind it: it is first necessary to pour over fried croutons over a melted meat glaze, already a difficult basic element to prepare; then place on top of the tournedos a whole slice of foie gras with truffles, and then make a sauce with Madeira and a demi-glace with essence of truffles. What restaurateur, even a relatively honest one, can make this demiglace with essence of truffles today? four slices of Norcia truffle cut quite thick, salt and pepper. Tie the tournedos so that they keep their shape in cooking. Cut the slices of bread to the same size as the tournedos and brown them lightly in a little butter in a pan. Place the tournedos on the butter and cook over a high flame on both sides for about three minutes. Then add salt and pepper, remove from the pan and place on a warm serving dish or keep them warm in a bain-marie. Blend the last piece of butter with the flour and put the mixture into the sauce; then dilute it with the boiling stock, pour in the Madeira and mix it with the cooking sauce. Add the demi-glace and cook over a low flame, stirring continuously until the sauce thickens. Place the tournedos on the bread and decorate with round slices of foie gras (which should be slightly smaller than the tournedos and which have been braised in the same pan on a very hot flame for fifteen seconds each side). Cut twelve discs of truffle and place three on each tournedos. Pour over the sauce, add the rest of the chopped truffles and serve immediately. So, there's one last ingredient to add: some music by the master chef himself. Which piece by Rossini might make the perfect side dish to the recipe? He did write a few musical hors d'oeuvres in his old age, pieces about anchovies, cornichons, raisins and nuts. But what about this little "Danza" sung by Pavarotti? Or the Barber of Seville Overture, which inspired Bugs Bunny to make a Carmen Miranda-style salad on Elmer Fudd's head? What do you think? Please leave your musical ideas in the comments section.